Citroen DS4 Reader Test Team | What Car? 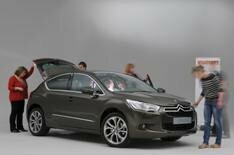 The Citroen DS4 comes under scrutiny from the What Car? Reader Test Team watch our video to find what everyone thought. What is the Citroen DS4? Its the second model in the premium DS range. It's based on the new C4, and is intended to be a five-door family-oriented luxury model instead of a three-door sporty hatch, such as the DS3. The DS4 is a little taller and shorter than the C4, but still looks like a semi-sporty SUV that could be a rival for both the Nissan Qashqai and even the Volkswagen Golf. Click below to see what our Reader Test team thought of Citroen's DS4. The scroll down the page to have a closer look at the DS4's interior. Get closer to the Citroen DS4 by having an intimate look around its dashboard. Just move your cursor around the photo below to zoom in.